"When someone arrives at your house, the first thing you say is 'hello' and the second is 'do you want a mate?' This happens in all homes, those of the rich and those of the poor." In our ramshackle little hostel in Cabo Polonio, Uruguay, there is no electricity. Once the sun goes down, we're all left to entertain ourselves in the darkness. On the night in question, a storm is upon us and, with our rudimentary shelter providing scant protection from the wind and rain battering against the loosely fitted windows, we try to distract ourselves. A middle-aged Argentinian couple have recently arrived and so we group around the kitchen table and, under the light of our headlamps, we teach them how to play our favourite card game. As is customary at this hour (at any hour actually), they're sharing a cup of mate (pronounced 'mah-tay'). Thermos flask on the left hand-side, yellow and green bag of herbs on the right and the silver rim of the cup twinkling under the fluorescent temporary lights. Wander through any street in Argentina or Uruguay and, after a few days, you'll certainly notice that these are a people addicted. Families share a hit on public buses, couples get a fix whilst sitting on a park bench, workers get as much as they can on their lunch hour and practically everyone is using it out in the open on a Sunday afternoon. The drug of choice is yerba. If you've never heard of it, then don't dismay. In an internet age where you sometimes feel like everything is already known, it was a pleasant surprise for us to have been so ignorant of what can only be described as an obsession in parts of South America. We had first seen the drink in the hands of some Latino travellers in Central America. However, as these travellers were also the ones who travelled in packs, sold hand-made jewellery, rarely washed and seemed to spend a lot of their time juggling, we simply put it down as a quirky way to drink your tea of coffee. Later, whilst watching the Copa America on television in our Ecuadorian hostel, the owner told us that two Argentineans girls had phoned him up this morning, crying down the phone. The reason? They had forgotten their mate (both the name of the beverage and the cup it's drunk from) and their yerba pack in the hostel. They were now a long bus-ride away in Quito and in tears. They pleaded with him to send their forgotten treasures over; they simply couldn't cope to be without it for the rest of their trip (the cup and the tea aren't easily found outside of the southern cone of South America). Clearly, this was more than just a drink. After arriving in Argentina, the mate phenomenon became abundantly clear. We were visiting the popular tourist site - Perito Moreno Glacier - and it was nearing lunch time. Scattered throughout the site are benches where you can sit and have a sandwich whilst viewing the stunning mountain of ice. Out of the beautiful leather bags we had been admiring from afar, everyone pulled out their flask, their cup and prepared a brew. To anyone who had just arrived in this part of the world, it would have been a quite bizarre sight to see dozens of people, young and old, holding such a public ceremony. Forget coffee, pizza, gnocchi, steak, empanadas, football, tango, wine, gauchos, salsa and asados. It is this drink that is fundamental to the identity of Uruguay, Paraguay and Argentina. Whole sections of supermarkets are dedicated to stocking thermos flasks whilst bags of yerba, hitherto unseen on our travels, took up more space than other teas, coffees and hot chocolate combined. In fact, in some places it took up more shelves than beer. We noted that those beautiful handmade tan leather bags, which are shaped as though they're made for carrying oversized binoculars, were mate-specific satchels with little compartments for all the paraphernalia. Public toilets and buses had signs stating it was prohibited to prepare or drink mate inside or on board. There were hot water stations at garages and on roadsides specifically so that people could fill up their flask with hot water. Men and women drank it while driving their cars. Bus drivers had bespoke little holders so it was never too far out of reach. Mothers held their babies in one arm whilst sipping from the other. We thought we had witnessed peak mate culture (read addiction) in Argentina, but it was nothing in comparison to Uruguay. There, I would honestly say that one in five people on the street were drinking it at any given time. In a busy Sunday market in Montevideo, the impracticality of mate as a 'to go' drink became clear but still, people couldn't be without it; they jostled through crowds with their uncovered cup in one hand and the flask tucked under their armpit (we christened this holding technique 'mate claw'.) After only a few days there, it wasn't a surprise to learn that Uruguay has the highest consumption in the region at 9 kilos of yerba per person annually. After witnessing just how popular and ubiquitous this previously unknown drink was, we were both eager to try it. Was it something we had been missing out on all our lives? Were we going to come close to tasting the tears of God? 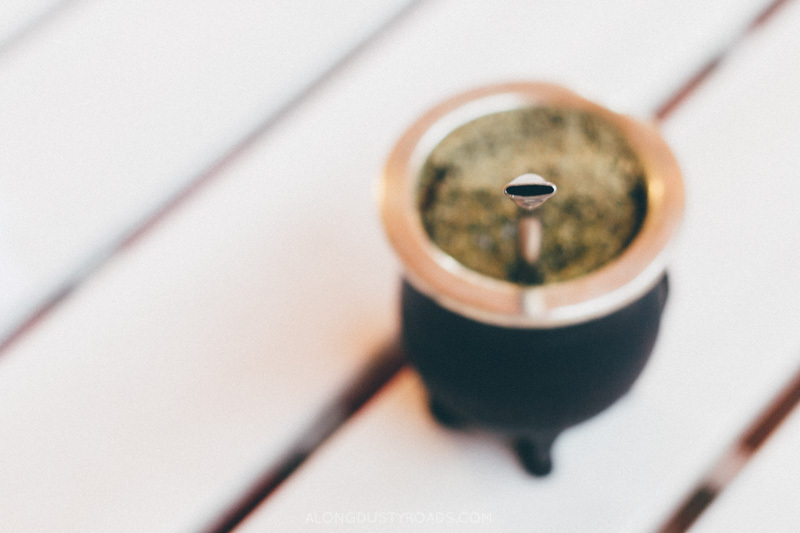 Previously on the trip, we had been offered to share a cup but, me being me, I refused as I wanted to keep my first sips of mate for Argentina or Uruguay, preferably whilst sharing stories with an old gaucho. That experience never transpired, so we had to find an alternative. However, it's not as simple as going into a café and ordering a cup. In fact, it's very rare for mate to be sold in such a way; it's not really viewed as a solitary pursuit. Instead, one carries everything from home and, usually, prepares and shares the drink amongst company in a mate circle. There's a lot of etiquette attached, such as one person acting as the sole server for the group, and unspoken rules. Everyone uses the same straw, everyone drinks from the same cup. So, for an enquiring gringo, getting hold of your first mate may prove to be a challenge and if an invite to a mate circle is not forthcoming (I did hint at several strangers on long-distance buses, 'oh what are you drinking there' but, perhaps unsurprisingly, they didn't invite me to partake). We didn't want to buy all the kit ourselves and prepare our first one as it was clear that, like in the UK with making a cup of tea, there are a few right ways and many many more wrong. We eventually found out about a new materia in Montevideo. Our young female server, taken a little aback at many questions we had about mate and our fascination with something which she considered pretty day-to-day affair, recommended that we try the weaker traditional blend first. Digging out spoonfuls of yerba from the green, white and yellow bag, she carefully prepared our drink. We had the three essential components in front of us - flask of hot, but not boiling water; wooden cup with a pile of dry green tea; long silver straw with a filter at the bottom and gold-plated mouthpiece. She explained how to pour, how to share, how to top up and how to rearrange the pile of tea leaves after each serving. Our respective first sips each drew the same scrunching up of our faces and retching gag reflex; it tasted bloody awful. Not just an 'oh I'm not too keen on this flavour' taste, but more of an 'oh my god, why the hell are we drinking this!!!' sensation. Each draw on the straw elicited the same response. Emily put it best: "it's like drinking green tea that's been left to brew for three days in a used ashtray." It's fair to say, my visions of finding a favourite new drink to take home, which would make us appear interesting and mysterious, were fading away. This was an acquired taste. And yet, we kept on sipping. Initially, it was just to save face and to avoid leaving our hostess thinking that we hated her country's favourite drink. But, after half an hour, we both started to want another sip. It was still awful, but after the initial taste of bitterness and stale fags dissipated, we wanted more. One of the most endearing aspects of mate is the tradition and ceremony which is attached to it. We've become accustomed as a society to people drinking weak, over-priced coffee in throw-away white paper cups. Nothing is permanent and the culture of disposability and being 'on the go' is unhealthy in a number of aspects; there's certainly something we can learn from mate culture. Ritual, togetherness, social bonding and owning the equipment which you use daily. I remember on old man waiting at the bus station with a battered mate case and a cup which looked like it had spent decades in his hand; it probably had. It was a beloved thing. From the few tastes I've had, I can understand why most first-time foreign drinkers of mate can't understand the fuss. However, there's no doubt that it has addictive qualities and, if you grew up in a country where over 90% of the population consume it, you will undoubtedly get hooked. But, perhaps, people are also craving the connection it brings to those around you, the signal that matters are going to be discussed, stories told and a mate will be shared. On our final morning in Cabo Polonio, we were waiting by the stop for the old open-aired trucks which would bring us along the beach to the main road. We started chatting to a couple of men who were also waiting with their young daughters. As expected, they were sipping their morning mate and finishing off a joint (also legal and popular in Uruguay). It turned out that one of them had lived in the UK for a few years. "How on earth did you manage without mate for so long? I don't think we even sell it in the UK." I asked out of genuine curiosity rather than flippancy. I was seriously unsure how these people coped without their fix; I was starting to understand that the Argentine tears in Ecuador weren't actually that unusual. He told us that it was hard for the first few months. He'd spent years drinking litres of it every day and being in the UK meant going cold turkey. But then, another ex-pat told him about a German website. So he bought packs and packs of the stuff. And he shared it, from just the one cup, with friends. Interested to discover more about Uruguay? Check out some more of our great guides.